Patti Warashina was born in Spokane, Washington in l940. She received her Bachelor’s and Master’s of Fine Arts degree from the University of Washington in l964. While in college she studied with sculptors Robert Sperry, Harold Myers, Rudy Autio, Shoji and Shinsaku Hamada, and Ruth Penington. Early influences in Warashina’s art include California Funk, Surrealism, and experimental West Coast ceramic sculpture from the 50’s and 60’s. 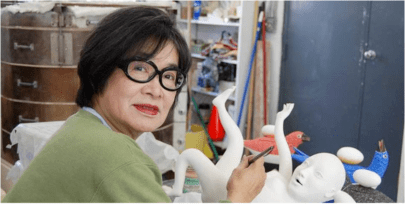 Her work is best known for satire, humor, and dream state figures, expressed through low fire polychrome ceramic material. Warashina has received several awards for achievement including the Twining Humber Lifetime Achievement Award in 2002 granted by Seattle’s Artist Trust, and the Distinguished Alumnus Award from the University of Washington College of Arts and Sciences in 2003. She received the Governor’s Award of Special Commendation for the Arts in l980, in addition to grants from the National Endowment for the Arts in both l975, and l986. In l978, Warashina was awarded through the World Craft Council Travel Grant, the Japan/U.S. Friendship Committee, and Ford Foundation to participate at the World Craft Conference in Kyoto, Japan, with travels in SE Asia. Her work is featured in museum collections around the world, including the Museum of Art & Design in New York City, the Seattle Art Museum, the Tacoma Art Museum, Henry Art Gallery, Seattle, Los Angeles County Museum of Art, the Smithsonian’s American Art Museum, Renwick Gallery, Washington DC, the Art Gallery of Western Australia in Perth, Ichon World Ceramic Center in South Korea, Kyoto National Museum of Modern Art and the American Museum of Ceramic Art in California. 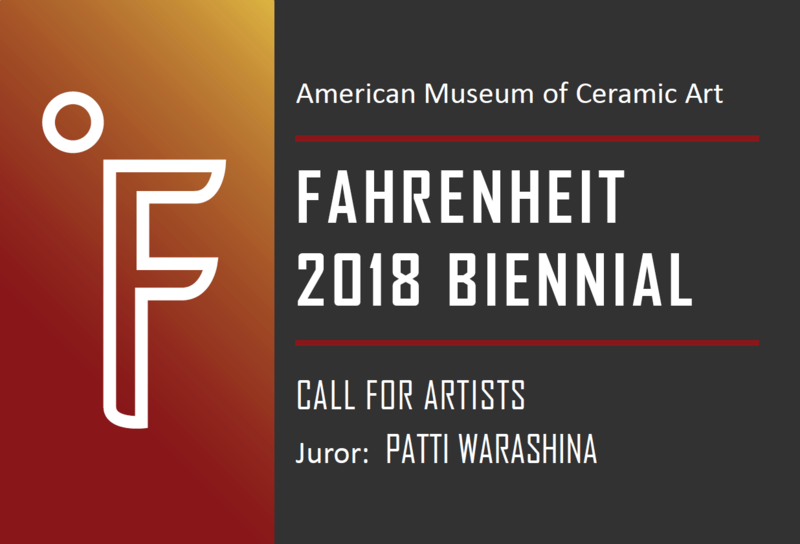 Submissions to Fahrenheit will only be accepted online. Click here to apply! $35 USD for up to 3 works. – The exhibition is open to ceramic artists 18 years of age or older. – Artists may submit up to 3 works for consideration, and up to 2 images of each piece (one complete photo plus one detail or alternate angle). – Artwork may be available for sale. Artists will receive 50% of the retail price on any sales. – The artwork exhibited must be the same piece(s) submitted for consideration. – Submitted artwork must not exceed 36” in any direction. – The artwork entered should be prepared for exhibition and the artist must provide any necessary mounting fixtures. Pedestals will be provided. – Artists are responsible for cost of shipping and insurance of selected work(s) to AMOCA. – AMOCA will pay for return shipping and insurance for the return of any unsold work. – Applications due September 30, 2017. – Entrants notified of jury results by email no later than October 31, 2017. – Work to be received at AMOCA no later than February 1, 2018. – Artwork will be shipped back no later than September 30, 2018.